What’s With All the #Hashtag Songs? With the Song of Summer not yet nearly decided — despite our best efforts to call it early — the odds are strong that the winner will have one thing: a #hashtag. (I have #hashtagged the word hashtag so that you’ll further understand my point. But you know what? #GetUsedToIt.) Record companies, and the artists they represent, are finally figuring out this newfangled .biz we call the Internet, and their initial response (after suing everyone’s pants off for downloading music, ha!) is #HASHTAGS. We’re certainly not the first to notice, nor shall we be the last. Big names are hopping on the #hashtag express all the way to Twitter-trending fame, and the real question is: Is this particular strategy going to last? Sure, after a song’s initial release, the title is definitely bound to hit high up on that list of trending topics, but soon after you’re left with a #hashtagged song title. Forever. Outside the context of Twitter and the Internet, it’s pretty silly. Next up? My personal pick for Song of Summer: Mariah and Miguel’s “#Beautiful,” whose one-word #hashtag was decidedly a strange decision. Why? Because tagging one word that people use pretty often happens to be useless on Twitter. It will no doubt get lost in the noise. Also, the song itself has nothing to do with #hashtags or the Internet. 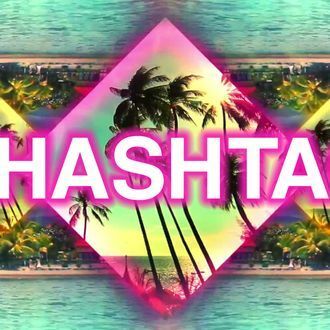 Can a song with a silly #hashtag name have the same staying power as one without? Imagine if Mariah’s “One Sweet Day” was released today as “#OneSweetDay”? But, hey, I’m a fan of THE FUTURE as much as the next @person, and today’s addition to the #Hashtag genre might actually be a winner. J.Lo and Pitbull’s “#LiveItUp” comes complete with a RedOne beat and a song title worthy of #hashtagging. Why? Because #LiveItUp is a summertime catchphrase just as much as it is now backed by a catchy EDM track. By attaching themselves to this feel-good attitude, J.Lo and Pitbull become the emotive #LiveItUp. Is this the final frontier for the Twitterization of music? Probably not. Naturally, as the way that we communicate about music changes, so will the way music is marketed at us. Will “#LiveItUp” stand the test of time? Who knows. But it’ll certainly last through the summer. Why Does Every New Song Have a #Hashtag?